The seasons in New England are one of the main reason I love Boston. From the skiing opportunities in the winter to the beaches and the parks from Rhode Island to Maine in the spring and summer, all the way to the fall foliage and fall fairs and festivals Bostonians can not complain. Last year Julie did a great job of itemizing the fairs that have grown to be annual traditions for many of us in the area. 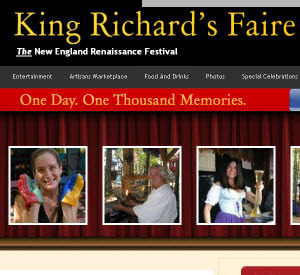 We will give you updates on the fairs and schedules at the end of the post but this year we wanted to highlight King Richard’s Faire which takes place on the weekends from September 4th to October 24th. Though Labor Day just passed they were open then and will be open on Columbus Day Monday as well. This New England Renaissance Festival is similar to Sturbridge Village in the sense that you are surrounded by people and activities that look like if they stepped out of a Knights of the Round Table type movie. A fairy tale type setting kids get a big kick out of it. Tickets range from$15 to $26 with kids 4 and under getting in for free. With activities ranging from games and rides to a zoo just to start with you are bound to find something that interests members of your family. There are also some themed events that may be an attraction for the college students who are back in town. You will have to plan though since Carver, Mass is about an hour away from Boston. Topsfield Fair – October 1st to the 11th in Topsfield, MA, If you have any Disney fans you may want to check out Mitchel Musso and Emily Osment who will be performing on October 9th. We have decided to have dedicated post for OctoberFest/OktoberFest types of events that were included in last year’s fair article.